After exams were over, I took the opportunity to spend as much time as possible with my boys. I used to take our time together for-granted back when I was a full-time SAHM. Now that I'm a WAHM/PTWM, I cherish our quality time together. Other hobbies like knitting and blogging have definitely taken a backseat! But I have big plans for this blog of mine ;) Watch this space! We are leaving to visit DH in Indonesia next week. I am really looking forward to that! I've been very disciplined about shopping these past few weeks - only because I want to have enough funds for an Indonesian shopping spree, muahahaha! We will be in Jakarta and Bandung, so if you have any glam shopping destinations to recommend, please do so. It would be a huge plus if the place is kid- and stroller-friendly too. Speaking of strollers, I fear that soon I shall be utilizing my double stroller more often (it has been collecting dust up until now). At only 15 months, Afraz is slowly getting too heavy for me to wear, and he is becoming a lot less interested in being carried in a sling (unless he wants to nurse). I suspect he would really enjoy riding side-by-side with his idol (his big bro) when we are out and about. But I just can't bear the thought of not babywearing anymore! The thought has actually brought me to tears. I am as saddened by the thought of stopping active babywearing as I am of weaning my children off the breast. I am just so attached to the practice of babywearing and breastfeeding, and it has become such a huge part of my life (both personally and professionally). But I will have to embrace the fact that my babies are outgrowing these stages in their lives, slowly but surely. I am comforting myself with this thought: As they get older, I will find more aspects of my children's lives to get involved in and be passionate about - (home? )schooling, athletics, hobbies, weddings, grandchildren, etc etc. So, I suppose I need to start preparing myself for what I used to think was impossible - I have to now focus on the fact that I am raising men, not babies! Here's to hoping that this blog will remain till I can change the title to "The Diaries of a Glam Grandma"! Haha! I absolutly understand what you are going through. Riley is 17 1/2 months and I can't bare to bring out the double stroller yet, even though he's my youngest, we've used it literally 6 times or so and it cost a fortune! hahaha to not use a carrier anymore is giving in that my babies are all grown up and theres no more coming. So, I bought myself a few Ergo's - They're good until 40+lbs and in a back carry quite comfortable! so not only do we still carry Riley (22 lbs) we carry Noah now too who loves his piggy backs (31 lbs) Although admittedly not as cuddly as a close wrap, you still get lots of snuggles! Awwww! I've only felt it today!! Was about to war the winning Mei Tai from Jumpsac and Khairaldin didn't want to be worn! He thinks he's all big and can walk/crawl where/when ever! :( but he knows when I pun on any carriers it means it's going out time. Once we're out of the house, he wants out of carrier. Grrrrr! Hehehe but I'm not giving in. Until he can walk, I'll carry. The physical attachment maybe kurang, but u know u've build a forever lasting bond with them. That's what matter most kan? 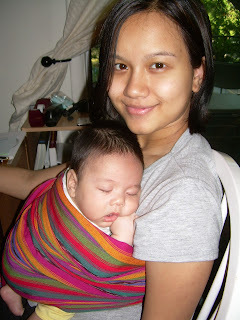 about babywearing, yup..i miss it a loooooooooooot toooooooooooo. used to enjoy it so much, but only when Miya was still below 8kg..
After that, aiyok patah my back lor. I still do have to carry her in a sling sometimes when she throws tantrum of not wanting to sit in the stroller. Sometimes its fun, but most of the time, it takes a huge toll on this little me. Julie: I've tried the Ergo, and I just didn't feel it :/ Most SSCs are too big for me, the Ergo included. Wrapping is still do-able at this stage, but the heat here is unbearable when I wrap! Iva: You won a JSMT?? Cool! Do make a post about it k :D And yes, once kids are mobile, they're definitely less keen on sitting in a carrier! Fathinz: Haha..inshaAllah panjang la umur dapat wear my grandkids...amiiiin...hehe..
aaahh they grow up too fast! surprisingly, my 2 years 7 months old Adam is now suddenly soooo interested in being worn. i haven't worn him in a long time, now if i offer him a back carry he'll jump at it and be really cooperative. not only that, i'll get lots of hugs and kisses afterwards as a thank you!